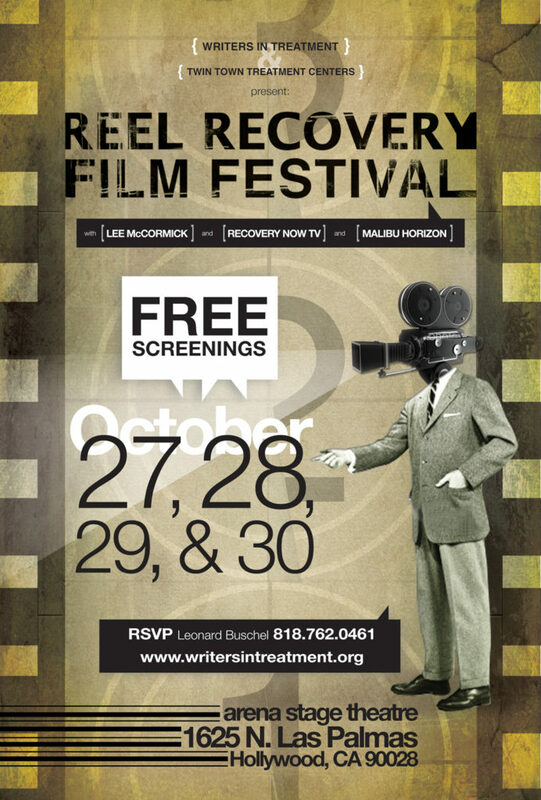 (Los Angeles, CA 2010) – On the heels of a groundbreaking 2009 event, Writers In Treatment (www.writersintreatment.org) is proud to announce the highly anticipated return of the REEL RECOVERY FILM FESTIVAL. Oct. 26-30, in Los Angeles. Arena Stage Theater, 1625 N. Las Palmas, Hollywood, CA 90028 Dec 15-16 in Nashville, TN. Whether you are a novelist, screenwriter, cinefile, addict or the other 2% of the population, this year’s REEL RECOVERY FILM FESTIVAL will not only change the way attendees view addiction and recovery, but also will identify and celebrate some of the creative minds that are currently redefining how the masses can learn and grow from addiction and recovery. Leave your anonymity at the door and be prepared to share an honest experience with a healthy mix of entertainment icons, addiction and recovery experts, top therapists and total strangers with one thing in common – an appreciation for the journey through addiction and the lessons learned as a result. While last year’s festival left an indelible mark on the community by featuring a rare opportunity to hear both Ben Stiller and Jerry Stahl discuss “Permanent Midnight”, and actor Danny Huston and U.K. director Bernard Rose discussed and screened their 2000 cult classic, IVANSXTC. BARFLY co-star Roberta Bassin talked about working with Mickey Rourke and Faye Dunaway while also caretaking Charles Bukowski during his frequent visits to the set. This year’s festival will be taking things a bit further by featuring four New York City biopic classics (POLLACK, BASQUIAT, BASKETBALL DIARIES and CIAO! MANHATTAN.) with several surprise guests set to participate in post-screening discussions. Packed with various perspectives and vastly differing schools of thought, these discussions are certain to get to the core of the topic and not safely dance around the issues. It is this sometimes uncomfortable dynamic which ensures an unforgettable experience for all those in attendance. The Betty Ford Center is hosting OPENING NIGHT on Tuesday, Oct. 26th with a 25th Anniversary screening of the “The Honour of All”, the extraordinary film about the Alkali Lake Indian Tribe in British Columbia, Canada. The film shows how a reservation suffering a 100% alcoholism rate, then achieves an 80% sobriety rate which they have maintained to this day. Elders from Alkali Lake will be present and lead a traditional drum circle ceremony around several square blocks in Hollywood, CA. Writers In Treatment is a 501(c)(3) non-profit organization grounded in the arts and recovery fields. W.I.T.’s primary purpose is to save lives through promoting and providing ‘treatment’ as the best first step solution for addiction, alcoholism and other self-destructive behaviors. We also offer educational, prevention and awareness programs through our W.I.T. Author/Outreach Series. Similar to Betty Ford bringing addiction out of the closet 28 years ago, WRITERS IN TREATMENT wants to help bring recovery out of the closet today.